All of Ada's wedding bands are custom made to perfectly complement your engagement ring. Our wedding bands made by hand in the United States and feature sustainably grown diamonds as well as responsibly sourced metals. No mass-produced settings, no compromises. 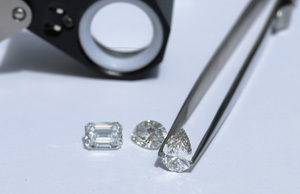 Want to upgrade your current ring to a larger, higher quality lab grown diamond? Learn more about Ada's restoration, upgrading, and replication services. Celebrate your love with an eternity band made from the finest cultured diamonds on earth.